PowerPoint presentations are everywhere. But you always think of presenters reading either their notebook display or the projector screen. That’s because in each case the speaker fails to capture the attention of their audience. So, they fail to make the link between themselves, the material and the images in their presentation. This is where the point, turn and talk technique comes into action. A very simple presentation skill—point, turn and talk—should help you get around the main problem. But, how do you reference your presentation material and maintain eye contact with your audience? In truth the fault is not PowerPoint. It’s the presenter’s problem. And it shows their dependence on using the graphics package as both a prop and a speaking aid. Using the prop a speaker feels invulnerable with the depth and breadth of slide information. And with the speaking aid the presenter isn’t familiar with the essential points of their presentation. The results are predictable: death by PowerPoint. But there’s a better approach. Reduce your dependence on text; reduce your bullet lists; shorten your bullet list length. Incorporate less information on the slides. More graphical content is a fine substitute. But you could practise your point, turn and talk technique. It’s a presentation skill that allows you to refer to the information on a display screen, seize your audience’s attention and then explain with the necessary detail. align your words with the screen’s content. move and be animated when speaking. don’t read from your screen. You can use your point, turn and talk skills to project an animated and knowledgeable presenter. Take the opportunity to combine an effective PowerPoint presentation with plenty of audience eye contact and, of course, subject interest. And, of course, that’s the sort of thing we expect in a 3-minute thesis presentation. 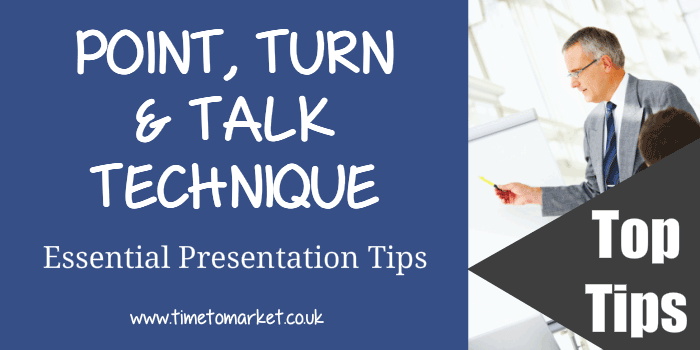 You can learn more about the point, turn and talk technique and other presentation skills tips on a PresentPerfectTM training course at one of more than 40 training centres. alternatively, you can always have a corporate training day at your offices. So, please don’t hesitate to get in touch when the time is right.